If your dog has already been tested by our testing partner Embark Veterinary, we REALLY want your Doberman's ALT results to learn about how the GPT mutation specifically impacts Dobermans. Note that these results will be shared with other researchers, along with your dog's genomic and health information for research purposes. 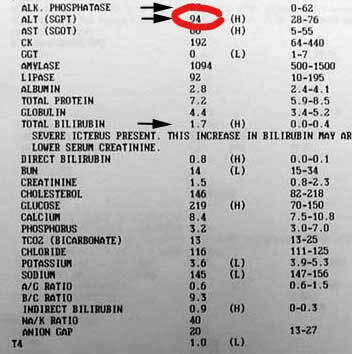 Look for the number on your dog's report (see red circled ALT reading on the sample report below). To identify your dog's ALT Number/Results to share with us, look for the number on your dog's report (reference the report on the right to see the ALT number for this example dog, circled in red). ​The chart on the right from Cornell University shows updated ALT normal ranges. For dogs, the normal ALT range is now 20-98.